Option: Download a printable two-page brochure (PDF Format). What causes competent and dedicated investigators to make avoidable mistakes, jeopardizing the successful resolution of their cases? 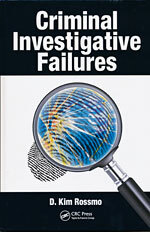 Criminal Investigative Failures comprehensively defines and discusses the causes and problems most common to failed investigations. More importantly, it outlines realistic strategies for avoiding investigative pitfalls. I have been involved in the investigation of the murder of 12-year-old Stephanie Crowe for many years and have provided expert testimony in both the criminal and civil cases arising from this murder. In Chapter 8 of Criminal Investigative Failures, “Who killed Stephanie Crowe?” I recount how a flawed investigation led to the indictment of three innocent teenagers. A subsequent thorough investigation prevented the ultimate miscarriage of justice by bringing the true killer to justice, but not before the the original investigators and the FBI, experiencing a type of institutional folie a’ deux, devastated the lives of three young men and their families. It took years to reveal how a cascading series of errors, including anchor traps, tunnel vision, groupthink, belief perseverance, ego and other pitfalls, put the investigation on the wrong course and then locked it into a fatal tailspin. The chapter is offered in an attempt to present an educational note on how to identify, understand, and hopefully, avoid these errors. Copyright © 2003 - 2019, Behavioral Criminology International.